Photo by Caroline Lowe, "Hawk Eye" staff, 2009. Article by Catherine Schepp, staff writer for the "Hawk Eye," February 2009. Working in our school's College Center is the author of 11 books, Dr. Sally Kneidel. Kneidel said that she began writing books after teaching her children’s elementary school classes about insects as a volunteer parent. During her lessons she would help the students conduct experiments and would compile their data. These activities reminded her of how much she had loved writing and compiling data in the process of earning her PhD in Biology/ Ecology from the University of North Carolina at Chapel Hill. While volunteering in the elementary school, she kept records of all the lessons she designed and soon had enough for a book. With an agent, she quickly found a publisher for that first book, Creepy Crawlies and the Scientific Method: More than 100 Hands-on Experiments for Children, which has won awards such as Science Books and Films' “Best Books for Children" (1992-1995). She followed that book with a number of others on science education, and on the natural history of small backyard creatures. She wrote several children’s guides to insects, such as Pet Bugs. She said that her focus changed dramatically when her daughter, Sadie, then a junior in high school, decided to become vegetarian. Kneidel, who was a vegetarian in college herself, said that the family decided that giving up meat was truly the socially responsible thing to do. One thing led to another, and while Sadie was in college, Sadie and Sally began researching and writing together. In researching the environmental impact of livestock, the Kneidels learned that clear-cutting forests to graze livestock and to grow food for the animals contributes more to global warming than transportation does. She said that their realization that more people needed to know about the importance of decreasing their meat consumption led her and Sadie to write a new book. Co-written by Sadie Kneidel, the book Veggie Revolution: Smart Choices for a Healthy Body and a Healthy Planet deals with their investigation of the poultry, pork and beef industries and the corporate treatment of animals. Kneidel and her daughter went to numerous factory farms and food-processing plants and talked with workers there. These visits led the Kneidels to seek more humane farms that use sustainable methods. In researching their most recent book, Going-Green-Consumers-Shrinking-Planet, they met local farmers like Cassie Parsons and Natalie Veres, who co-own Grateful Growers Farm where they keep 25 laying hens in each spacious hen house, as opposed to more than one million hens at a Food Lion factory they visited. Going Green focuses mainly on the importance of buying local produce, on environmentally conscience ways to heat and cool homes, and on green transportation. They also found lists of farmers markets around North Carolina. Kneidel recommends many of these for families seeking high quality organic and local products. Center City Green Market on Seventh Street is convenient for uptown families. Matthews Community Farmers Market offers a variety of foods grown by local farmers within a fifty-mile radius of Matthews. Kneidel said that buying local produce is especially eco-friendly because it minimizes the amount of travel time, fuel, and emissions involved in transporting foods. 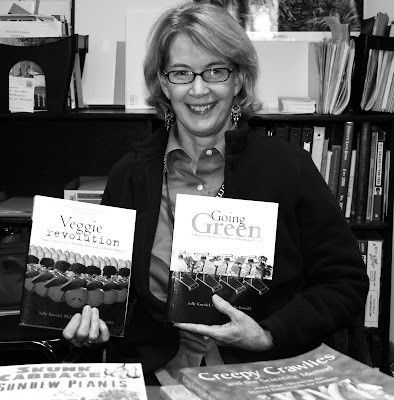 If students or parents are interested in any of the books written on the scientific method, vegetarianism or green living written by our very own Dr. Sally Kneidel, they may find them on Amazon.com. It is interesting. I wish this concept of going green could be taken seriously in Kenya where I come from. The whole thing can have positive impact in aleviating poverty. It is good to note that a version of this may already be on course in what is known as "Kitchen Gardening Initiative" introduced for the farm workers in one of the Multinational Tea companies in Kenya.